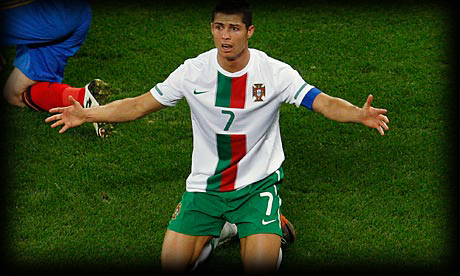 01.04.2011 » Is Portugal selling Cristiano Ronaldo to Spain? No! It's April's fool day. April's fool biggest joke was published by the newspaper "The Independent". The English media launched the false story stating that Portugal had sold Cristiano Ronaldo to Spain, as a move to fight the serious economical and financial crisis the country is going through. The 1st of April is a popular date in several countries and a good reason for that to happen is the fact that many people fool others with funny false stories and lies. This year's most popular April's fool, put Cristiano Ronaldo on the spotlights, when one of the biggest English newspaper "The Independent", published a news article stating that Portugal had sold Cristiano Ronaldo to Spain, for a transfer fee of 160 million euros, as a way of issuing national debt and fight the crisis. This particular joke, "takes advantage" (in a good way) of a very bad economic situation that Portugal is going through. The published story is based on a few true facts, like the Portuguese Prime Minister José Sócrates resignation from last week, or the record downgrading for Portugal's credit rating. Therefore, it may actually fool many people. Cristiano Ronaldo influence and popularity is so big, that if this sort of transfer/move was even possible, the English newspaper says it would be enough for the International bond markets to take it as a sign of Portugal determination to overcome the financial crisis. But obviously, Portugal's financial crisis won't be solved with an utopic transfer. "The Independent" also joked with the different reactions such kind of transfer would enhance in the Portuguese people. According to the story, the public opinion would be divided, as some would see Cristiano Ronaldo transfer to Spain, as the "ultimate patriotic gesture" to help his own country to fight the economic crisis. Others however, would read this move as a final "surrender". Before ending the story, "The Independent" also referred that England's Prime Minister, David Cameron, was preparing a counter offer of 200 million pounds, to persuade Cristiano Ronaldo to play for England, instead of Spain. The newspaper went further and added David Cameron's false statements: "The Premier League is where Cristiano Ronaldo became a star, so it is only right	and proper he should play for England". Let's hope everyone can take this an original April's fool joke and don't take it too serious. Afterall, what would be of us without a bit of sense of humor? You can read the original story in The Independent's website on this link: Cristiano Ronaldo - April's fool story. Don't forget you may watch Real Madrid vs Sporting Gijon livestreams, online here on ronaldo7.net tomorrow, even though Cristiano Ronaldo won't play yet.